My 2nd DX weather widget, created using the Wincustomize WIKI tutorial: "Desktop X: Builder Mode for Beginners". This widget is based on the "Silica Weather" widget which is included with DesktopX. There aren't alot of other skins on this site that are pizza themed, you can click on this link to perform a site search for skins containing the term "pizza", I found 3 - one of them is a Pizza Mail dx widget. Because of that I think I will work on some companion skins to go with this, maybe eventually an entire suite of pizza themed skins. I'm having alot of fun working with dx widgets. Also this pizza theme gave me some ideas for other projects which may come in time and I worked up quite an appetite during the creation process - LOL! 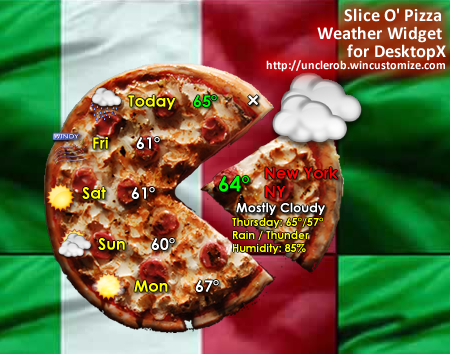 I hope you don't get too hungry while checking the weather.